I’m a breakfast girl and one of my favorites growing up was when my mom made pancakes in the morning! Here is a really easy comfort recipe that will sweeten and perk you up on a cold morning. Add dry pancake mix in a large bowl. Pour in almond milk and stir until you reach a nice, balanced consistency (not too runny, not too chalky). Stir in sliced bananas and whole flax seeds. You may need to add a few more splashes of milk if the batter gets too thick. Heat a tablespoon of Earth balance in a stove top pan on medium heat. Heat for 2 minutes, coating the entire pan. Pour pancake batter into pan, forming a circle shape for your pancake. Heat for a few minutes and then flip with a spatula (this is the funnest part). Repeat this process until you use up all the batter and each pancake is cooked thoroughly (you may need to flip back and forth several times). In a separate pan, heat Earth balance on medium heat. Add fresh chopped apples, toss and stir. Add brown sugar and cinnamon. Continuously toss around the apples. You want the cinnamon and sugar to coat the apples. Continue heating the apples until they reach a tender consistency (not mushy, do not overcook them). The goal is not to make apple syrup, but to still have a chunky topping for your pancakes. 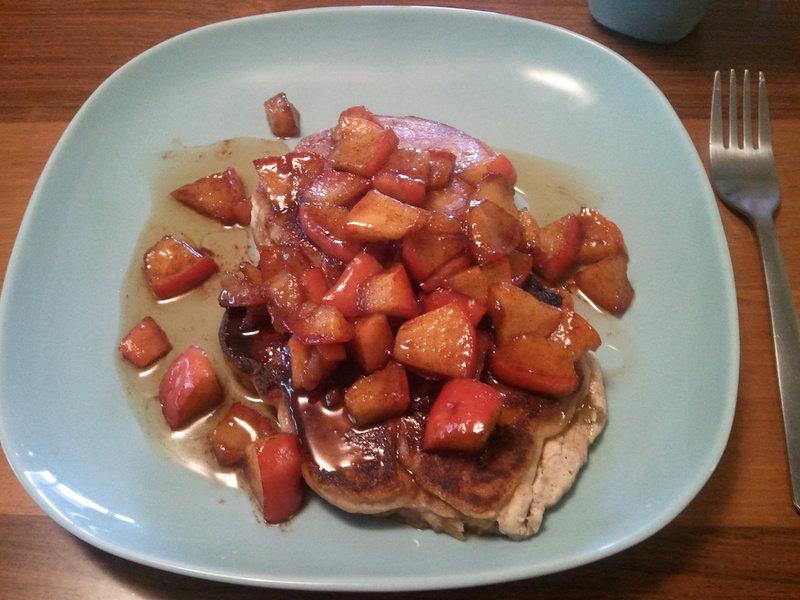 Pour your apple cinnamon topping on top of your pancakes. Add premium maple syrup and enjoy! *For added deliciousness, you could spread a layer of almond butter on your pancakes before adding the apple cinnamon topping. This is very decadent, but very delightful. **Flax seeds are a great source of fiber. They are also great to add to yogurt or oatmeal in the mornings. ‹ PreviousA Walk, the Locks and a Duck.